Economic development is mostly a mystery. In every city, in any given neighborhood, on any given day, people and resources move in and out, to and from an unknowable number of places and sources. To do economic development, you don’t need to know everything, but what you know to start, and whom you know it with, can put you and your larger community on the path to equity. Or not. 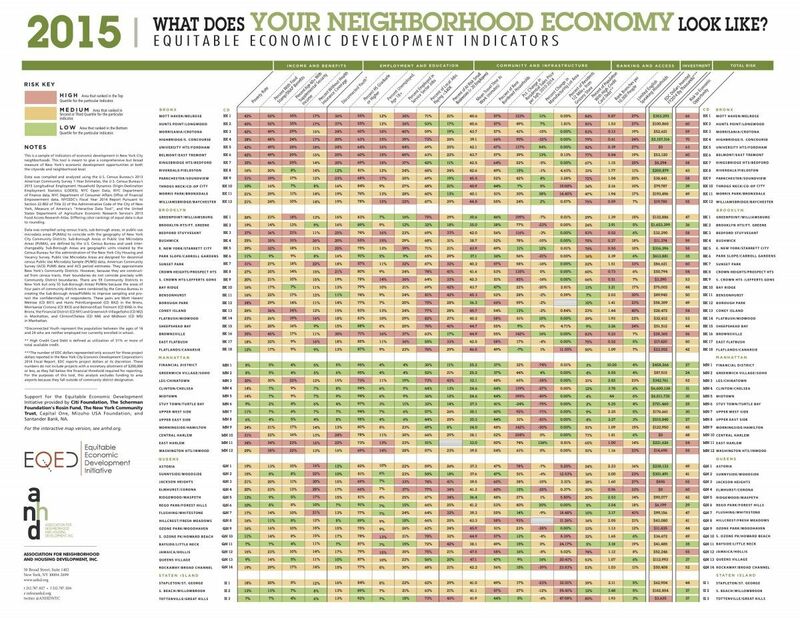 For the first time in NYC, economic development can start with everyone being on the same page: the first-ever edition of “What Does Your Neighborhood Economy Look Like?,” a chart (and interactive map) created by the Association for Neighborhood and Housing Development (ANHD). The chart lays out 19 economic factors, disaggregating them by NYC community district. Some are obvious — poverty rates, percentage of households on food stamps, high school graduation rates, citywide economic development dollars spent. Some are less obvious, but essential to discussions of equitable economic development — percentage of local jobs paying less than $40,000/year, percentage of at-risk small businesses, percent change in land dedicated to manufacturing. “We cut down a ton for the final chart. I would say it was almost three times the size it is now,” Afridi says. With factors in columns and community districts in rows, the chart assigns each cell a color — red for high risk, yellow for medium risk and green for low risk. So at a glance, you can see which neighborhoods and also which boroughs are most vulnerable or most in need of economic investment. The Bronx is mostly red, Brooklyn is mostly yellow, Queens and Staten Island are yellow with pockets of red and a little green. Manhattan is mostly green. The chart was based loosely on ANHD’s Affordable Housing Risk chart, an annual community-by-community listing of affordable housing at risk of going market-rate. “The housing market is this complex interaction of market forces and city programs and neighborhood conditions. Economic development is similar,” says Benjamin Dulchin, executive director at ANHD, which counts 101 community development groups throughout NYC as its members. As ANHD members move more and more into the economic development space, the chart is a response to that shift, meant to serve as a tool to bring together existing but siloed conversations about bits and pieces of equitable economic development. Organizing data according to community district, both charts help focus advocacy and perhaps connect new political allies that are facing similar issues in neighborhoods across the city. “As our members are beginning to say more locally, no housing is affordable without a job,” Dulchin adds. AAFE began doing economic development work, focusing on small businesses in and around Chinatown, in the late 1980s and early 1990s. AAFE’s early equitable economic development work led to its eventual establishing of the Renaissance Economic Development Corporation, in 1997. Renaissance has since made $28 million in loans to 700 small businesses in Lower Manhattan. It’s now a federally registered CDFI, and was the third largest U.S. micro-lender by value of microloans closed in FY2015. In addition to getting economic development discussions onto the same page vis-a-vis equity, ANHD’s new chart may also have useful implications for individual organizations. Given AAFE’s focus on equity and access, Kui says Renaissance EDC could use the chart to help know where riskier neighborhoods might need lower interest rates to drive access, and where they might charge slightly higher interest rates to help strengthen long-term sustainability.